KOLKATA: Darjeeling seems headed for yet another showdown, with state government-supported Binay Tamang trying to supplant the Centre's man, Bimal Gurung, in the Hills ahead of the 2019 Lok Sabha polls. The problem is that both suffer from a trust deficit among the public when it comes to Gorkhaland because none of their mentors — the state and the Centre — is ready to grant statehood. This has left the Hills people confused, making the situation ripe for exploitation by insurgent groups. 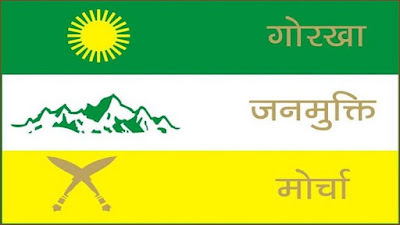 All Hills outfits other than Gorkha Janmukti Morcha (both GJM factions) — Subash Ghising's GNLF, R B Rai's CPRM, Harka Bahadur Chhetri's Jan Andolan Party (JAP) and Akhil Bharatiya Gorkha League (AIGL) — realise this but are not in a position to roll out a roadmap acceptable to the people. One reason could be that these parties had drifted away from Gorkhaland at some point of time or the other and, therefore, do not have a grip on the masses. The result is a battle of oneupmanship between Gurung and Tamang packed with intrigue and backstabbing in which the majority Hills people have no stake. A background check on the two men reveals that both were on the same page till the latter chose the "democratic" route. For instance, Tamang was the one who founded Gorkhaland Personnel that has now come in handy for Gurung. Tamang has criminal charges and cases against him like Bimal Gurung, who has also been charged with sedition. "It was Binay Tamang and Anit Thapa who burnt the GTA Act only the other day, and wanted to impose stringent restrictions in the Hills at Gorkhaland Movement Coordination Committee meetings," said GNLF leader Neeraj Zumba. With the ranks divided in their loyalties between Gurung and Tamang, both leaders are gearing up for a fight to the finish, Gurung with his private militia and Tamang with the backing of the state police. All police stations in the Hills have been put on alert over Gurung's plans to return by October 30 with the situation inching towards a climax before chief minister Mamata Banerjee reaches Pintel village for the next round of talks with Hil-ls parties on November 21. "There is no freedom of expression for parties like us till then. We have been denied permission to hold public meetings. Even police won't give us permission for hall meetings. Houses of tea garden workers with party affiliations are being raided by police at night. It is an undeclared emergency in the Hills," CPRM spokesperson Govind Chhetri said. Zumba, however, insists on talks with stakeholders. "We opened doors for talks with the state when the agitation hit a wall. We now want the Centre to hold the tripartite talks. Let the Centre play its card first. We have our roadmap clear and will make it public after the Centre takes a stand," Zumba said. JAP president Chhetri also held that tripartite talks on Gorkhaland could re-engage the people in the Hills. Darjeeling seems headed for yet another showdown, with state government-supported Binay Tamang trying to supplant the Centre's man, Bimal Gurung, in the Hills ahead of the 2019 Lok Sabha polls.